The Communications and Marketing Executive (CME) is responsible for Asia Centre’s outreach to its different target audiences and the management of its events. To execute this function the CME creates a range of content to promote the work of the Centre through its and third-party media assets, networks, influencers and the mass media. The aim is to create an audience for Asia Centre’s activities, events and services. This position is only open to Thai nationals. 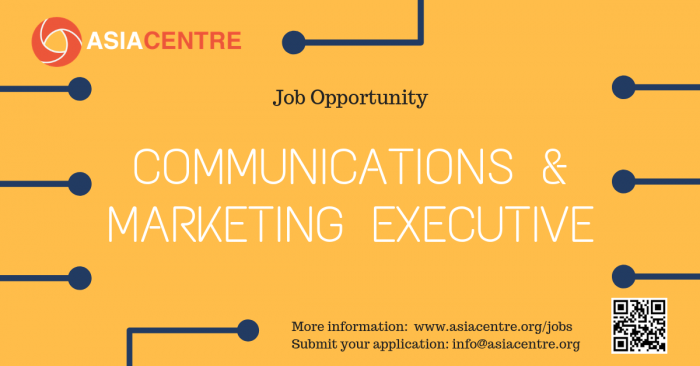 Interested applicants are requested to send (1) their CV together with (2) a self-introduction letter and a (3) sample of writing (4) a portfolio of their design, photography and/or video work (5) expected salary to info@asiacentre.org. Shortlisted candidates will be invited for an interview. Following the interview, a timed, written assessment will be issued as part of a proficiency test. A final selection will be made thereafter.